I’ve been wanting to grow some veggies in hanging baskets. I have quite a few coco baskets, but they dry out so fast, my crops will end up withering away in the heat we’ve been having. I decided to head to Walmart to pick up a few plastic hanging baskets. I’m looking to add more eclectic pieces to my garden and olive green planter weren’t what I had in mind, however at $4 a piece, they were in the budget. I figured I could snazz them up a bit by spray painting them, so that’s exactly what I did. I went for a nautical look and although a bit messy, I think they turned out okay. 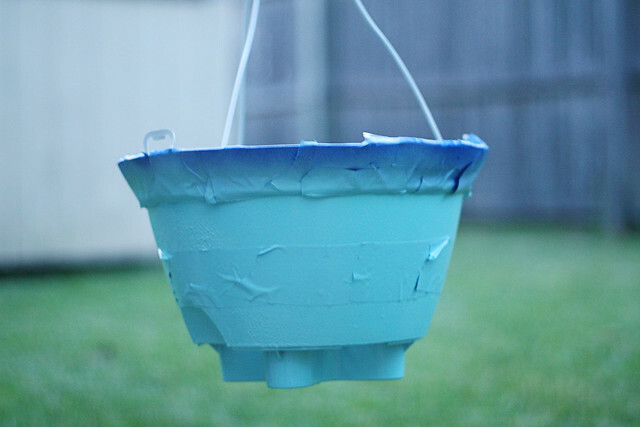 First, I painted my planters solid cream and let dry overnight. 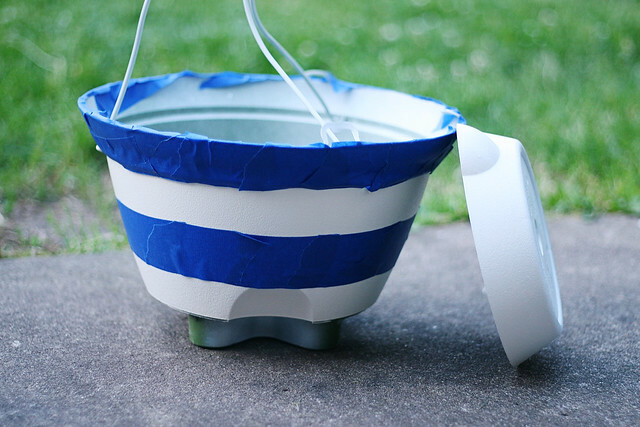 I then, taped some thick stripes around the planters using painter’s tape. It was so hard to get straight lines. Maybe next time I’ll use some thick rubber bands or something more pliable? I spray painted two coats in between the tape and let dry overnight. I carefully pulled the tape off to reveal the mess that I had made, lol! It’s still cute! 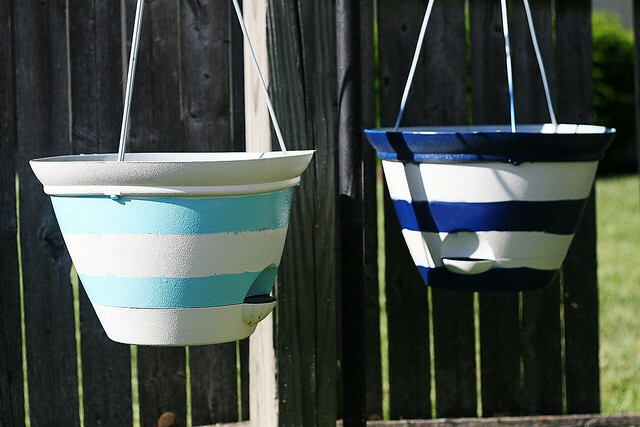 These planters can be dressed up with shells, a painted red anchor, or rope. I chose to keep it simple. Once my pepper bushes start hanging over the planters, any extra details (or mess) won’t be visible. 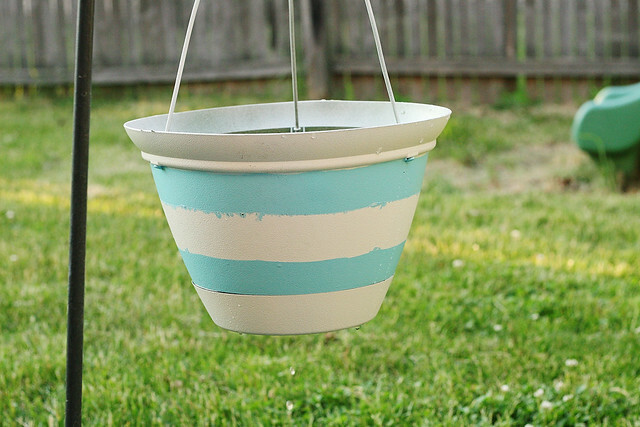 I’m really digging the turquoise color, so I’ll probably paint the (hot mess of a) navy striped planter a solid turquoise. I just wanted to see how it’d look using a traditional nautical color. What was I, the queen of non-traditional, thinking? Red would have probably been better. Hmm. I am a member of the Walmart Moms program. Walmart is compensating me for sharing this DIY project experience. My participation is voluntary and all words and opinions are always my own. Read my full disclosure policy here. Very cute idea. I only use terra cotta (pot snob, lol!!) 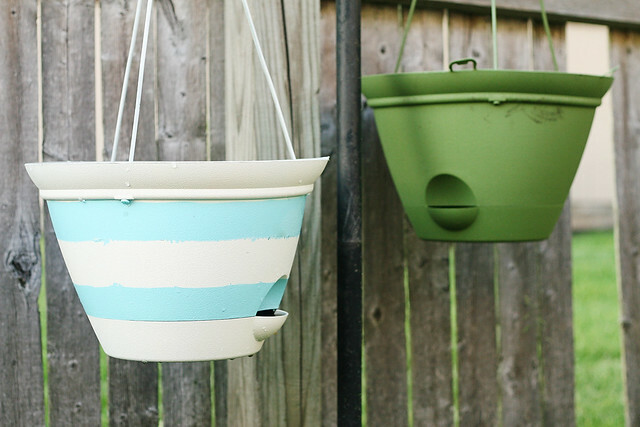 One year, I tried doing a Martha Stewart type thing where you let the paint run down the sides of the pots. Wellll… Mine came out looking someone has been bludgeoned w/the damn thing -lol. So I leave them be now. 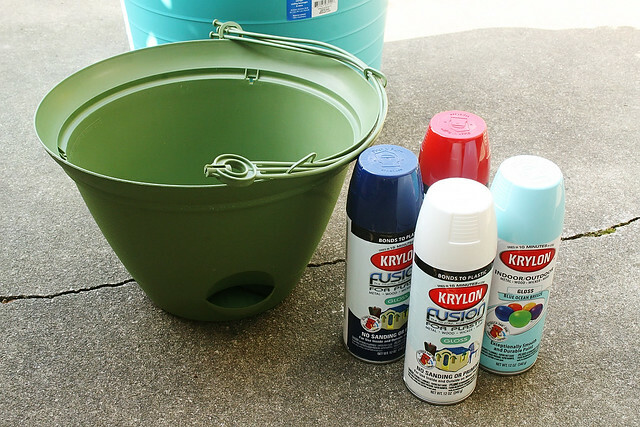 Your idea is excellent for plain pots. They look so cute! And so different with just a change of color. Thanks, so much better than olive green!